Home remedies for canker sores can bring fast, soothing relief to people who suffer from them. Not to be confused with cold sores, also known as Herpes Simplex 1, canker sores are quite painful, but are not contagious. Since they can reoccur, learning about what causes canker sores, as well as home remedies and natural cures to treat them is very helpful in their overall treatment. Canker sores are small ulcers that appear inside of the mouth. Simple canker sores are common in people between the ages of 10 and 20 years old. They can occur 3 or 4 times in a year, but typically only last up to a week each time. 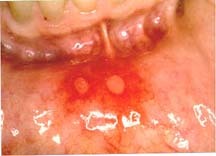 Complex canker sores are sometimes found in people with other illnesses. They are less common, but mostly occur in people who have had canker sores before. Canker sores appear on the inside of the mouth on the tongue, inner cheeks, inner lip or gums. Sometimes, before an ulcer erupts, a person may feel a tingling sensation in the area where a canker sore ultimately appears. Once a canker sore is present, it will appear as a round, gray or white ulcer that is sometimes outlined in red. In the case of complex canker sores or a severe case of simple canker sores, a person may experience a fever, severe fatigue and swollen lymph nodes. While it is useful to know how to use home remedies for canker sores to naturally cure them without medications, if a sore last longer than a few weeks and if other symptoms, such as fever or fatigue are present, a person should seek medical attention right away, as this could be a sign of a more serious underlying condition.